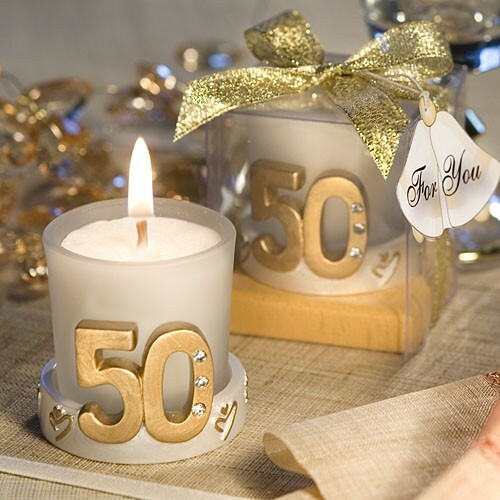 Share the glow of 50 wonderful years of marriage with these decorative and useful candle favors on your event tables. Sold only by Fashioncraft, each favor has a frosted white glass holder with a poured white candle center, resting in a round gold resin base. The base's rim is cheerfully decorated with freeform heart designs. 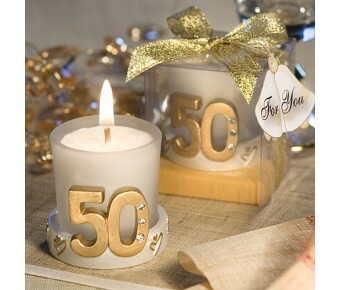 A bold gold, rhinestone enhanced "50" extends upward from the base, hugging the glass candle holder. 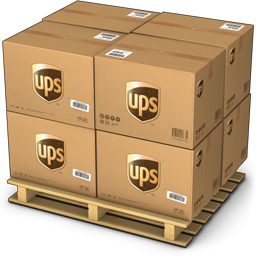 Each candle favor is 2" x 2" x 2" and comes packaged in a deluxe clear topped box with a gold base, tied with a metallic gold ribbon and attached wedding bells thank you tag.